Courtesy of JASIG Team Leader Gary Wenko we have some images of these recent kits to share. The Unicraft 1/72nd resin kit of the Ki-73 is a "single engined version" of the Ki-83. Unicraft specialise in "What-If" versions of Japanese secret projects and prototype development aircraft. Gary notes that despite the rough resin castings of these kits they can be turned into very interesting models. Having seen what Gary has done with some of them I can testify to that! Check out their website for the full range. The second kit is the Anigrand 1/144th scale Rita, which comes with "bonus" kits of the Kokusai Ta-go, Ki-119, Rikugan Ki-202 Shusai-kai and Ki-115 Tsurugi. Gary notes that the Anigrand kits are very nicely molded with crisp detail. Anigrand have other Japanese "heavies" available in their "Huge Bird Collection" 1/144th scale range, including the G10N1 Fugaku, Kawasaki Ki-91 and Nakajima G5N-1/2 Shinzan. 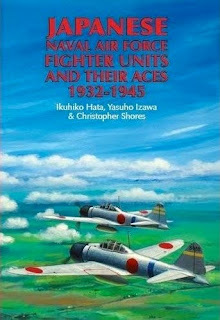 "This book is a companion volume to "Japanese Army Air Force Fighter Units and Their Aces, 1931-1945", published by Grub Street in 2002. As such it also represents a major updating and rewriting of Messrs Hata's and Izawa's earlier book of similar title, published in the USA some 20 years ago. The book commences with a comprehensive account of the operations of navy fighter units throughout the period under review. This is followed by individual sections detailing the history and achievements of each unit involved, be it land-based or aircraft carrier-based. A major section then provides biographical details regarding all pilots claiming eight or more aerial victories. 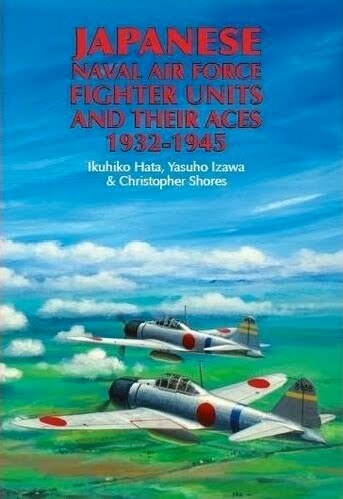 As might be expected of such a work, prolific appendices provide detailed listings of all pilots known to have claimed five or more victories (and thus considered to be 'aces'); listings of the graduation from training of all Japanese Navy fighter pilots, and of fighter pilot casualties. The book is profusely illustrated with photographs, maps and artist's side-view drawings and paintings of aircraft relevant to each of the units described." Was it really 20 years ago? Goodness me. The new dustjacket illustration looks good but it brings to mind yesterday's blog post! Indeed it was 20 years ago that the book on Japanese Naval Units and Aces was released, and the revised edition will no doubt be most welcome. But, in picking up on Nick's comment re the cover art, it seems the artists aren't listening. In Darwin the remains of A6M2 No. 5349downed during the 19 February 1942 air raids are on display - the finish has deteriorated to a light grey with a 'chalky' feel and appearance, but once you buff it lightly the ash-green described so often is evident. I forwarded on a small piece of this aircraft to Nick for analysis and it shows both finishes quite clearly. An Intelligence report filed on this aircraft states that whilst the Hinomarus were bright, the aircraft itself took on a 'bleached effect'. So, had the cover artist depicted one of the two aircraft with a slightly darker (or ash-green) colour and the other the grey depicting use in operations then it may have been more realistic. I recently completed the first artwork in many years depicting a Zeke of 3 Kokutai flown by Lt Takahide Aioi and a Takao Ku G4M1 Betty. I tried to get the effect of the three months the unit had been in operation to March 1942 by finishing it in a slightly greenish/brownish (the caramel colour so oft described) grey but with a paler grey over some areas. It seems to have worked but of course there's always a glitch - advised to have two red tail stripes I did just that - only to find later that he had two white tail stripes! Nothing's perfect. But, the continued use of a pale grey to depict even newer Japanese aircraft seems to be the trend rather than the result of any research into the actual colours themselves. A sample I have from Aichi D3A1 Val, also downed over Darwin has been kept in ideal conditions for 60 plus years and shows a much darker grey-green - later samples again show a faded finish. Is any one scheme right or wrong? Only the dreaded colour police can tell us - based on their obvious expertise of course, I say tongue in cheek. Please use your influence to convince Mr. Shores and Grub Street Pubs to continue the series with another title: "Rikugun Jubaku-tai", the war service of the IJA bomber units. Then there is the old rumor of an unpublished and unfinished Rikko manuscript.